The Italian educator and physician Maria Montessori was the first Italian woman to receive a medical degree. She was the originator of the Montessori method of education for children. 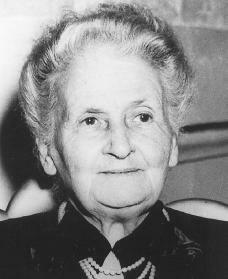 On August 31, 1870, Maria Montessori was born in Chiaravalle, Italy. Her father, Allessandro Montessori, a retired army officer, was very traditional. Her mother, Renilde Stoppani Montessori, was an intelligent, modern-thinking woman from a wealthy family. Maria's mother taught her daughter how to be compassionate by giving her the task of knitting for the poor every day. Maria herself chose to scrub a portion of the tile floor every day. Much later, as a teacher, Montessori included such work in her studies for children, calling them "exercises of practical life." As an elementary school student Montessori blossomed. She was average in intelligence, but good at exams, and she lead her classmates in many games. She found the classroom set-up and repetitions very boring, yet she learned. When it came time to leave elementary school she had to ask her parents if she could continue. Women in her time were not encouraged to get more than an elementary school education. Montessori's father discouraged her interest in a professional career. With the encouragement and support of her mother, however, she prepared herself for her later career. When she was twelve, the family moved to Rome, Italy, to take advantage of the better educational facilities. An interest in engineering technology and mathematics led her to enroll in classes at a technical institute at the age of fourteen. Later an interest in biology led to her decision to study medicine. This decision required some courage, because of society's views on women's education. In 1894 Montessori became the first woman to receive a medical degree in Italy. Her experiences in the pursuit of this degree reinforced her already well-developed feminist (in support of equality of the sexes) ideas. Throughout her life she was a frequent participant in international feminist events. Montessori's first appointment was as an assistant doctor in the psychiatric clinic of the University of Rome, where she had her first contact with learning disabled children. She became convinced that the problem of handling these children was as much one of teaching method as of medical treatment. In 1898 she was appointed director of the State Orthophrenic School in Rome, whose function was to care for the "hopelessly deficient" and "idiot" children of the city. She enjoyed tremendous success in teaching the children herself, while refining and applying her unique methods. In 1901 Montessori left the school to pursue further studies and research. In 1906 the Italian government put Montessori in charge of a state-supported school in the San Lorenzo quarter of Rome, which had sixty children, aged three to six, from poverty-stricken families. By this time her early successes with learning disabled children suggested to her the idea of trying the same educational methods with normal children. She used what she termed a "prepared environment" to provide an atmosphere for learning—that is, small chairs and tables instead of rows of desks. The basic features of the method are development of the child's natural curiosity through responsible and individual freedom of behavior, improvement of the sharpness of the five senses (hearing, seeing, tasting, touching, smelling) through training, and development of body coordination through games and exercise. The function of the teacher is to provide educational material, such as counting beads or geometric puzzles, and act as an adviser and guide, staying as much as possible in the background. Montessori's view of the nature of the child, on which the Montessori method is based, is that children go through a series of "sensitive periods" with "creative moments," when they show spur-of-the-moment interest in learning. It is then that the children have the greatest ability to learn, and these periods should be utilized to the fullest so that the children learn as much as possible. They should not be held back by forced, rigid curricula (plans of study) or classes. Work, she believed, is its own reward to the child, and there is no necessity for other rewards. Self-discipline (controlling oneself) emerges out of the freedom of the learning environment. Montessori's method was basically at odds with other major twentieth-century trends. Thus it was used only by a relatively few private schools. Since the early 1950s, however, her system has enjoyed a revival and a renewed interest in learning disabled children. Her works have been translated into at least twenty languages, and training schools for Montessori teachers have been established in several nations. Kramer, Rita. Maria Montessori: A Biography. New York: Putnam, 1976. Reprint, Reading, MA: Addison-Wesley, 1988. Shephard, Marie Tennant. Maria Montessori: Teacher of Teachers. Minneapolis: Lerner Publications Company, 1996. Standing, E. M. Maria Montessori: Her Life and Work. London: Hollis & Carter, 1957. Reprint, New York: New American Library, 1984. She began studies in engineering at the Regia Scuola Tecnica Michelangelo Buovarroti. From this experience she began to model what a school should not be like. She also made the decision not to continue studies in engineering. Her relatives, friends, and father were all relieved to here that she would veer away from such an un-ladylike discipline. I hope my information will be usefull.